The last two days I have been at The Powder Group’s Artist Summit. The Powder Group (TPG) is a group that is very dear to my heart and one I work closely with from time to time. They are a group that has given me the opportunity to be part of something far bigger than myself and far bigger than just the small (but wonderful) makeup artist community I was a part of. I realize that I don’t speak about beauty very much on here – something that will soon change – but this industry is a huge part of my life and to not write about it on here, wouldn’t be true to who I am. And, on another post, I will be writing about the fitness and food portion of this trip, but this post is about so much more. It is about community, it is about passion and it is about building your knowledge – not only as a makeup artist, but as a person and as someone who has dreams of becoming more than they already are. I almost feel like it is unfair to write this post today, since there is one more day of the summit. And, tomorrow someone I consider family – a mentor – is speaking. But, maybe I will have to add an extra post for that because what I am feeling tonight should not have to wait to be written. Yesterday morning changed my world. It changed my view of the beauty world, the art world and the artist community (including it’s supporters) in general. For a few hours yesterday, my faith was restored to a level that I didn’t know was possible. It wasn’t that I had lost faith in the beauty world, it was that I had lost faith in myself and my place in that world. It was that I had started to question my place in this world (beauty, not in general)- never in my community – but more where I fit in. And yesterday, thanks to mainly Chris McCarthy and Michael Angelo a piece of me was changed. I am certainly not taking away from the other beyond incredible presenters. Particularly, Michael DeVellis, Kate Leydon or Kevin James Barnett & Johnny Lavoy – but the profound words that came from Chris and Michael Angelo were ones that will speak to me most likely for the rest of my life. (esp. of a person) thinking about or planning the future with imagination or wisdom. a person with original ideas about what the future will or could be like. Chris is someone who is a mile apart from most – she sees, she envisions and she does – and she never ever quits. Now, I was able to learn all of this solely from hearing her speak for an hour at The Artist Summit; because who she is is so profound and so easily and beautifully detectable even if just by listening to her path. What is The Artist Summit and what is The Powder Group? First, The Powder Group is international network for makeup artists started by Michael DeVellis ten years ago. It has some of the greatest education for artists, teaching not only about artistry, but about your career path and truly finding your place in this community. It also signifies professionalism, family and true artistry. You don’t have to be the best, you can even have decided to become a makeup artist yesterday and have just picked up a brush for the very first time, but you will find support, family and a true community of thousands. I don’t know how Michael DeVellis and James Vincent did it, but it is obvious they lead this group with nothing but passion and heart because that is what these artists give back ten fold. So, that is TPG. What is The Artist Summit? The Artist Summit is sort of TED talks for the beauty community. Michael and James have gotten the very best of the best in the business to tell us about their paths and their stories. To share things from how they got started to why they believe and KNOW that beauty and makeup is more than just beauty and makeup. It is a three day educational summit for the professional makeup and beauty community and it is incredible. 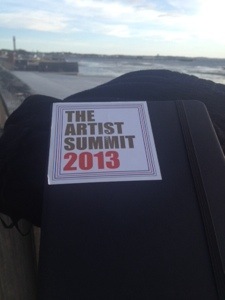 The Artist Summit is held in Provincetown, MA which is the one of the artist capitals of the world, being the oldest still “operating” (for lack of a better term) artist community. Some of the most incredible artists came right from Provincetown, yet the art center they had wasn’t an acceptable location for them to even show their own artists that came from here. If you think about that, it is truly heartbreaking. Chris was offered the job to be the director of PAAM at a time that the museum was seeing some of it’s worst days. There were holes in the ceilings, empty hallways where art lovers should be and walls that were not capable of holding the art that this town truly deserved (and I don’t use that term lightly) to have. Chris, who was a big deal in the museum world was skeptical of taking this job on, and rightly so, but something told her to take it. When she decided to accept, she also decided to make big changes. She was met with massive skepticism, disdain and even threats, but that did not stop her. Chris’s dedication and passion for art, artists and the life of PAAM kept here in P-town and had her follow through with what has become one of the most incredibly beautiful museums I have ever seen. I realize that I do not know P-Town well, though I am deeply in love with what I do know, but from what I feel and what I have seen and heard, Chris changed this community by bringing home the art that built this community. When the renovation of PAAM was finished, they were able to have some of the most sought after art work hanging on the walls in the truest artist community I have ever known. To me Chris’s passion is something I felt. She is real, she is true to her heart and she truly trusts her instincts and because of that she gave me something that I can hold onto for the rest of my life. A small view to her passion, work ethic and heart, that I can only try to emulate in my world. Now, for Michael Angelo… and quite possibly the longest post I’ve ever written on here. I have known Michael Angelo for about two years, and I know this because when I was the beauty editor for Bloginity I did an interview with him (click here to read) and fell in love. Michael Angelo is the most beautifully unassuming person that you can meet. I truly have trouble understanding how so much passion, artistic brilliance and talent fit in his small frame, but it does. As I mentioned above, I have been struggling lately with my place in the beauty and makeup world. Many would say it is because of my renewed passion in the fitness world, but the truth is, one thing has nothing to do with the other. The truth is, I have been struggling with bringing good to the world through my makeup life. I work pretty consistently, and I am so incredibly grateful for that, but I was struggling with how I am helping anyone by grooming hedge fund owners as they explain their quarterly reports to their clients. I understand how bridal makeup artists bring good or how someone working on a music video brings good – but I was having a personal struggle. Until I listened to Michael Angelo. From a very young age Michael always thought against the grain. He would look at something that most just simply take for granted and he would want to do brilliant things, in ways that most people couldn’t imagine. Michael explained yesterday how when people told him he couldn’t do things, that those were fighting words (something that I completely understand) which is most likely why he learned how to do hair and makeup in ways that most don’t and why he literally made his own career as opposed to following others. To me Michael followed the path, but dug up brand new roads and trails to get there. I believe the thing that got me the most from his talk yesterday was when he became interested in what Somaly Mam was doing. Somaly Mam was a woman who was sold into sexual slavery at a very young age. She had been forced to work in a brothel along with other women and children for many years where she would be brutally tortured and raped. Somaly escaped, but could not leave others behind. She dedicated her life’s work to saving victims, building shelters and programs for healing, and empowering survivors to become agents of change. Michael Angelo had read an excerpt where a young girl opened the door to the brothel with red lipstick smeared across her face and, there an idea was born for Michael Angelo. I could literally write for pages about this project, but I don’t think I would do any better than just having you learn about it from the Somaly Mam site and this interview. Michael took his passion and he took the art of being a makeup artist, hair stylist and photographer and he gave back. He changed people’s lives through this and to me, well, that was something that I needed to hear again. I needed to feel it and know that things like this very much do happen in the beauty world and, regardless of if I am working on a woman from Dress for Success, a commercial shoot or a talking head for a hedge fund, beauty does incredible and beautiful things for so many people. I would love to live in Michael Angelo’s visions for just a day, because he sees things. He does things that most think aren’t possible or think may even be a little crazy and he does them anyway. He shocks people with the beautiful outcome from a vision that they were not able to see until he showed them and that takes a true artist. So, I am feeling very blessed to have been here to witness both Chris and Michael. They brought life back to something I think I was trying to bury out of sheer confusion and, thanks to TPG, it was handed to me on a silver platter of brilliant summit knowledge. Is a successful NYC based makeup artist - you can see her work all over TV, in top magazines all over the world and she has been featured in the New York Times, Prevention Magazine and numerous other publications, she is the former beauty editor for Bloginity and owns a small boutique beauty business called Brush Beauty. She has had a few careers ranging from construction management to radio and everything in between, however, the constant passion in her life was always fitness. Even when she lost her way from it, she was always constantly motivated by athletes and anything movement oriented around her. She is the type of person who only gets star struck by people like Gabby Douglas, Matt Long, Pat Riley or Kerri Walsh and the thought of meeting any of them puts her stomach in little girly teenage knots. Favorite workouts: Bootcamps, Spinning, swimming and lifting alone with my headphone on.